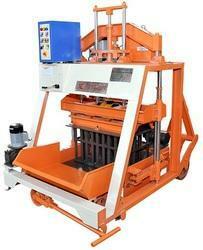 Chirag Simple And Easy Handling Cement Brick Machine Target User: requires high production output of concrete blocks, in different types, sizes, shapes and colours. We offer our clients an excellent assortment of Block Making Machine that is available in different specifications as per the requirement of our clients. Our range is extensively used in brick manufacturing industry due to its high efficiency and cost effectiveness. Our company has gained name and fame in presentingCement Brick Making Machine.